Happy Easter today while you celebrate the Resurrection and the coming of Spring. It’s a particularly exciting time for members of St. Paul Lutheran Church of New Braunfels. They have chosen to build a new church on their historic property. While traveling down San Antonio Street towards the plaza, I noticed a building program going on at St. Paul Lutheran Church. There was a wonderful old stone building, still part of the campus and they were building around it, still preserving it. Lutherans have been in Texas for a long time. On November 8, 1851, the first Evangelical Lutheran Synod of Texas was organized by the St. Chrischone Missionaries. They were interested in establishing mission churches in the Guadalupe Valley of Texas. At the second convention of the Synod in May, 1852, Pastor Braschler and Pastor Kleiss were present. Pastor Kleiss had been in the Neighborsville-Hortontown area as pastor for a newly formed group of Lutherans for two years and now Pastor Braschler was going to become the minister. Pastor Braschler served as both teacher and pastor of the Lutheran group. On August 13, 1854, a formal congregation organized under the name of the Evangelical Lutheran Saint Martin Congregation. It embraced both Neighborsville and Hortontown. 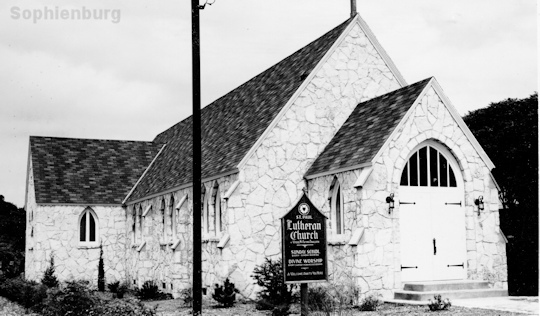 The St. Martin Evangelical Lutheran Church is known as the oldest Lutheran Church in Texas. Incidentally, Pastor Braschler’s home is still standing and located at 249 Kowald Lane. It has a Texas Historical Marker and is a Recorded Texas Historic Landmark. The land was sold to Pastor Braschler by Jacob de Cordova. De Cordova, along with church parishioners helped Braschler build the home. Rev. Milton Frueh compiled the history of St. Martin Church and he writes that the 1850 beginning of St. Martin is associated with founder, Pastor Theobald G. Kleiss from Germany. In 1851, the Neighborsville-Hortontown congregation erected a church building and the services were conducted in German. In 1852, Pastor Braschler became the minister followed by Rev. Albert Kypfer, who served from 1857 to 1880. Kypfer was the last full-time pastor. In 1870 a school was built next to the church. It was the Church Hill School that is still standing on Church Hill Drive across from Conservation Plaza. It is owned and maintained by the New Braunfels Conservation Society. It also has a Texas Historical Marker and is a Recorded Texas Historic Landmark. Near 1900, the Evangelical Lutheran Synod of Texas congregations ceased to provide a resident pastor for the church. Many members left and joined other German-speaking congregations like Friedens and First Protestant Church. For safekeeping, the church records were given to First Protestant Church and in 1968, the St. Martin Church building was moved from Church Hill Drive, a short distance away to sit in a prominent location on Loop 337 within the Hortontown Cemetery. St. Paul Lutheran Church owns and maintains the beautifully restored church. It is currently used for historical tours, weddings, church services and family gatherings. Twenty years passed with no Lutheran church, and in 1920 the Mission Board of the Texas District of the former Iowa Synod had been considering establishing a mission church in New Braunfels. In 1925, Rev. Henry H. Schliesser began conducting services twice a month in a building on Seguin Avenue (Mergele building). The organization of a congregation seemed favorable, so in 1926, the Evangelical Lutheran St. Paul Congregation was organized. A small chapel was built in 1927. In 1939, under Pastor Heineke, the building of a new church (currently the chapel that is still standing) was started and dedicated in 1940. A new sanctuary was dedicated in 1962, a full-time day school was organized in 1983 and an education complex dedicated. Martin Luther was behind the whole Lutheran movement. Who was Martin Luther and what influence did he have on the world? Martin Luther was born in 1483 and was a German professor of theology, a composer, a priest and monk, and was a key figure in the Protestant Reformation. He disputed the Catholic Church view that freedom from God’s punishment for sin could be purchased by paying money. He believed and taught that salvation and eternal life were not earned by deeds but a gift from God through believers in Jesus Christ. Those who identified with his beliefs and teachings were called Lutherans. The Reformation was aimed at the Late Medieval corruption of the Catholic Church that resulted in the Protestant movement. The word Reformation means to reform. Luther also translated the Bible into German, using a dialect that would reach most of the German people. Each state in Germany, at the time, had developed a different dialect of the language and in many cases, they could not even understand each other. By Luther translating the Bible, the German language became standardized. The language used in the translation became a part of the German heritage and the creation of a German identity. His goal was to make the Bible accessible to everyday Germans that could be used in church, at school and at home. He translated the New Testament from Greek in 1522 and the Old Testament from Hebrew in 1534. Although not the first translations to German, they were the most popular. This translation was one of the most important aspects of the Reformation. Luther’s hymns influenced singing in Protestant Churches. Of course, his most famous hymn is “A Mighty Fortress is Our God” sung to this day in many Protestant Churches. Luther’s Bible stirred a mighty storm in the church giving power to the clerically dominated public. A German, Johannes Gutenberg, invented the printing press around 1440. The invention and spread of the printing press was one of the most influential aspects of the time. It ushered in the modern age. By 1500, the printing press was in operation throughout most of Western Europe. The result was the permanent alteration of society. The circulation of ideas through the printed word, captured the masses in the Reformation and threatened current government and religious authorities. No longer were the elite only able to have access to education, the middle class emerged as educated. Other technologies contributed to the success of the printing press. About that time eyeglasses were in common use for those with vision problems. Gutenberg was able to take existing technologies to make his printing press operate successfully. The manufacture of paper had also improved and Gutenberg developed an oil-based ink suitable for high-quality printing. Martin Luther’s translation of the Bible could not have been done at a better time. The printing press allowed for mass production of the texts that were available for all. Once again, Happy Easter, St. Paul Lutheran, and congratulations on your new endeavor. Early photo of the St. Paul Lutheran Chapel.